Glimmer Mist is a fine water based spray that delivers just a touch of glimmer to all your projects, whether Paper, Acrylic, Metal or Fabric. Created by a Scrapbooker for scrapbookers, these products by Tattered Angels, are all acid free, archival safe and non-toxic. 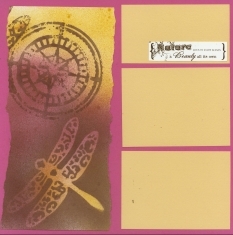 All the design on the layouts above were done from white card stock and using Glimmer Mist in 3 colors, two Glimmer Stencils of a Compass Rose and Dragon Fly, plus Garden Alpha Glimmer Chips. These 4 layouts on above were made using Glimmer Mist to design the background on white cardstock. The Mists used were Sunflower, Tattered Rose, and Olive Vine. The lighest color was sprayed on first, and in waves to provide shading. For the compass rose and dragonfly patterns, the Sunflower Mist was sprayed first and allowed to dry. Later, the stencils were placed on top and sprayed with the Tattered Rose leaving the Sunflower to show through from underneath. Scrapbook Advice Tip: When using the Mist on the Stencils or Glimmer Screens, be careful when you remove the stencil as it will have the mist on the top of it. A good thing to do then, is to gently turn it over and place it on top of new paper to have the opposite of the stencil appear. The two layouts at the top of the page were done this way. The Compass Rose on the left is the Stencil - the one on the Right is the stencil turned over making the image from the left over Mist. 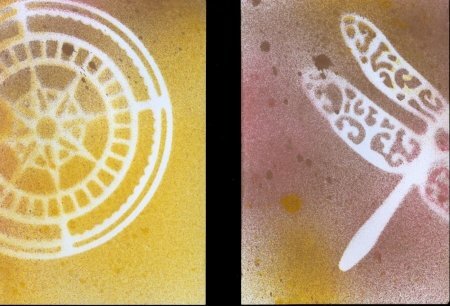 The Dragon Fly on the right is the right is stencil - the one on the Left if the image made from the left over Mist on the top of the Stencil. Glimmer Chips - are also used here. The chips were Embossed Chipboard Butterflies, with cut out Ovals in the center and with letters cut from the center of the ovals. 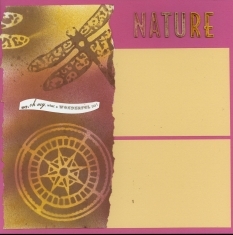 In this case, they spelled out the word NATURE. I applied the Glimmer Mist to a craft Mat and rubbed the front of the chips to coat them with the product. Then I punched out the lettering and used the letters themselves on the first set of layouts, the oval negatives on the second set of layouts and the Butterfiles on several layouts and projects. Since I was using three colors of the Mist, I coated two sets with one color each. 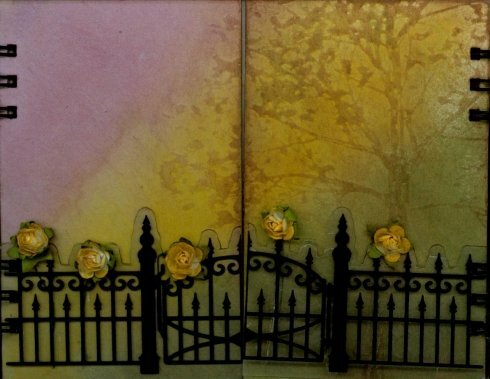 The Garden Gate Album below was purchased from Tattered Angels and the 3 Glimmer Mists used through out the album were Sunflower, Tattered Rose, and Olive Vine. This is the outside cover of the Garden Gate Fold Album. It was slightly embossed and the tree on the right side was lightly inked to bring out the image. The three colors of the Glimmer Mist were sprayed at an angle over the inking. The Gate image is Glimmer Glass, clear acrylic with the image of the fence and gate in black. I added the mini fabric roses, also misted with the Tattered Rose Mist. They were glued to the back of the acrylic with Glue Dots. The pages of this book are attached from alternating right and left spines. Every time you open the book there is a different assortment of pages, and half pages - always something new. 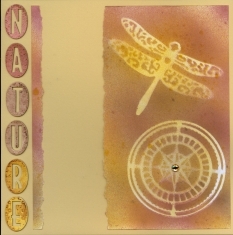 Inside the front cover, the Left and Right Pages are first misted with the Sunflower and Olive and are then stamped using Glimmer Mist sprayed onto the stamp. The image is the Screen Prints Clear Stamps - matching stamps and stencil set - called Blossom Trees. The full page in the center is misted with the Tattered Rose with flower images on the paper to mask out the White background from the Mist. The right corner was a patterned paper corner also misted with the Tattered Rose and three of the flowers with green brads for embellishments. This will be used as a pocket to hold a photo. On the left, the Glimmer Mist is sprayed lightly showing a lot of the droplets of the color. The tag was originally a Mamila tag, sprayed with SunFlower and then Olive Vine, and with two decorative Square Paper Clips. The Right hand page was Sprayed with 3 colors, then wiped with a Tissue to smooth out the droplets. The Flower was sprayed directly with Sunflower and attached with a large gold Glitter Brad. These two outside pages are sprayed very heavily with the Olive Vine and then wiped smooth with a Tissue. The center page was sprayed with several layers of the Sunflower and wiped smooth. Then the bottom right corner was sprayed with the Olive Vine using the small flowers as a Mask. Two of the flowers were attached with Brads to the upper left side of the page. 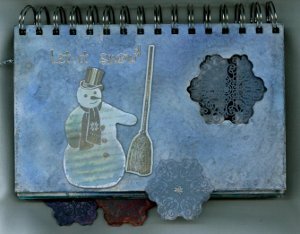 The page on the left was stamped with the Blossom Trees Glimmer Stamp in a light brown ink over the paper that had been sprayed with the Sunflower Mist. After the stamping was dry, the Stencil from the Blossom Tree was placed over the inking and sprayed with the Olive Vine Glimmer Mist. The page on the right was sprayed completly with the Sumflower. When that was dry, the Butterfly Glimmer Screen Stencil was placed over and sprayed with the new Summer 2009 Limited Edition color of Dreamsicle. 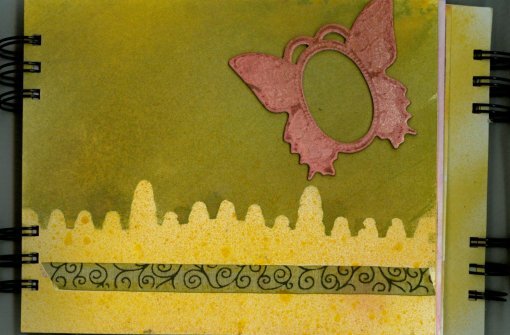 The other embellishments on this page were orange felt flowers and a buttefly. The left page here was misted with the Sunflower. The dried, the Blossom Tree Stencil Image was sprayed and the stencil was then inverted onto the yellow backgroud for a negative image of the stencil. The center page was sprayed heavily with the Olive Vine and wiped smooth at an angle. 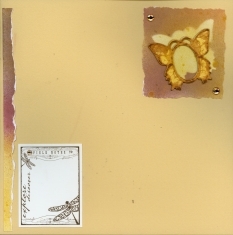 The Blossom Tree Stamp was inked with a light brown ink and stamped around the outside border of the page. The left had page, was misted with the Sunflower, then the Glimmer Glass from the front cover of the book was used as a Mask to spray the Olive Vine. This page, was misted with the Sunflower, then the Glimmer Glass from the front cover of the book was used as a Mask to spray the Olive Vine. The Glimmer Chip Butterfly, left over from the second set of layouts at the top of page was used as an accent. Photo mattes sprayed, then sprayed again with a stencil over the paper. These will be used with the second set of Layouts at the top of the page. 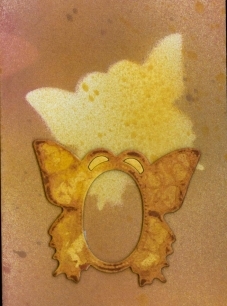 One of the Butterfly Glimmer Chips used to Mask the top color, then offset to show the image in two forms. This will be used as an embellishment in the Garden Gate Book. Angels Glimmer Mist, Glimmer Chips and Glimmer Glass. This scrapbook layout used a Stencil that I had from Club Scrap that came in their Parisian Kit from 2008. 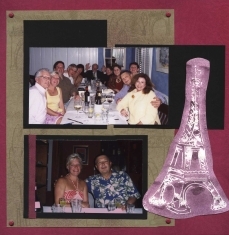 I sprayed the Tattered Rose Glimmer Mist on the stencil itself, then carefully placed the Stencil, mist side down on the white cardstock and Viola', instant Eiffel Tower for this layout about Dining out at our Favorite French Restaurant. Hopefully, you can see that there are many ways to use Glimmer Mists. While these photos can show you the basic outcome, you can't see the overall shine that the Glimmer Mist provides to all these projects so get a bottle of it for yourself and play with it to see what you can come up with. You won't be disappointed. and to purchase the product.